As Florida continues to count and recount votes, a key deadline loomed Thursday afternoon – and one key county, Palm Beach, missed it as the state's Senate race now moves into a manual recount. Florida counties had until 3 p.m. on Thursday to complete their initial recount of votes in the state's hotly contested Senate, governor, and agriculture-commissioner races. Palm Beach – a key Democratic county in South Florida that has been the subject of lawsuits and criticism by Senate candidate and Republican Gov. Rick Scott – missed the deadline, its top election official said. “We gave it a heroic effort,” Palm Beach Supervisor of Elections Susan Bucher told reporters adding that her county did not finish. Palm Beach’s counting machines had overheated and stopped functioning at least twice this week. Sen. Bill Nelson, D-Fla., exits the Senate subway en route to a vote on Capitol Hill, June 20, 2018. Florida Gov. Rick Scott, center, speaks during a news conference, Aug. 22, 2018, in Fort Lauderdale, Fla.
Recount deadlines are being contested in court, although a federal judge on Thursday denied Sen. Bill Nelson's request to extend them across the state. 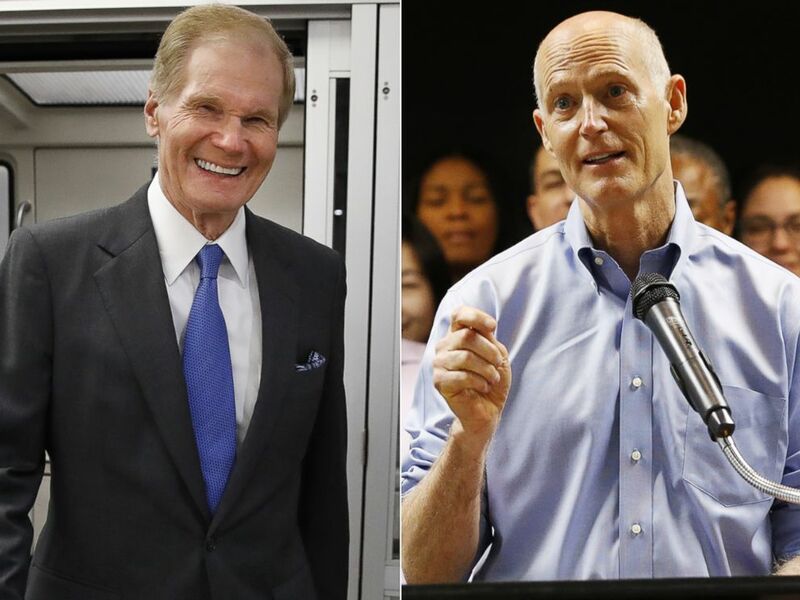 Two Florida races have drawn national attention – the Senate contest between Republican Gov. Rick Scott and Democratic Sen. Bill Nelson – and the governor's contest, between Mayor Andrew Gillum and Rep. Ron DeSantis. The Senate race and agriculture commissioner races will move to manual recounts. A manual recount is solely a hand recount of overvotes and undervotes in the affected races. An overvote is when a voter designated more choices than allowable in the recounted race and an undervote is when a voter made no choice or less than the allowable number of choices in the recounted race. The results of the manual recount will be reflected in the official returns due to the Department of State no later than noon on Sunday. The governor's race is less likely to meet the threshold for a manual recount. In the Senate race, Scott leads Nelson by .15 percentage points, according to current totals. In the governor's race, DeSantis leads Gillum by .41 percentage points. Gillum has urged Florida to count every vote. An unknown number of overseas and military ballots are still coming in – they can arrive until Friday, under state law. Counties will have until Sunday to count them, and official results are not expected to be known in either race until after that happens. A federal judge on Thursday denied Nelson's request to extend recount deadlines. But Nelson did score a win, in his bid to allow provisional and by-mail ballots where signatures did not match those on voter-registration books, as required by state law. A federal judge gave voters whose ballots had been rejected until Saturday to correct the issue with election officials. The ruling will affect an unknown number of ballots. Just under 4,000 ballots are known to have been rejected, but that total does not encompass all counties and lacks totals from some key ones, like Duval and Miami-Dade. Nelson is also challenging Florida's laws over what ballots count, seeking to expand considerations of when a voter intended to select a specific candidate with a ballot mark. ABC News' Adam Kelsey, John Verhovek, Stephanie Wash, and Karen D’Uva contributed to this report.